How valuable would an extra hour every day be to you? Ever found yourself saying, I will, when I find the time or, time got away from me? Well this time management artilce is for you This is part of the series of artilces on time management the 7 Steps to Create an Extra Hour a Day? 1. There is no such thing as time management! 2. Time is for spending. 7. Dont mistake activity for achievement! Step 2 in this series is about time management and goal setting. Most people tell us they don't have enough time -- time poor as it is referred to these days. We also find that many people are not sure how they would spend their time if they had, say an extra hour a day. What would you do with you extra hour a day. Take some time to think about that (and sleeping is not an option). What we are talking about here is time management and goal setting. What are your time management goals? How clear are you about what you want to do with more time? We have found that if you are not clear then you don't "find the time". 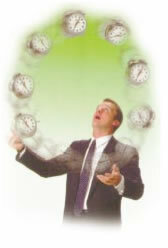 When you are really clear about how you would use your time then you have a great basis to start making some changes. Spend time with your family. Step back on work ON the business. Go the gym. Do something FUN. That's the initial response we get. Then they say things like "it would just get taken up by more work" or "I'd feel guilty I spent a whole hour everyday, just for me." And so there goes the chance that you will get time for yourself. Research from the DNA of success found that 7 out of 10 goals that people set are NOT achieved. The reason  because the goals were not based on a core desire and were not aligned with values and beliefs. Yet 8 out of 10 goals are ACHIEVED (in our experience) when supported by your real desires, values and beliefs. If you had an extra hour EVERDAY this week, could you tell me in 10 seconds what you would do. Most people cant, so they continue being busy rather than effective! Be totally honest with yourself. This process requires you to think deeply. Write your asnwers on paper to get even more clarity.